Mis compras las hago en diferentes tiendas. Busco donde estén las cosas más baratas por lo menos. La Walmart, en esta tienda compro mis cosas personales: jabón, champú, detergente, líquidos para los baños. En la tienda Mi Pueblo compro una parte de comida. Busco lo que esté en especial. En la tienda china compro la otra parte de comida y siempre busco lo que esté en especial. Mi ropa la compro en la Ross y sí, siempre busco o que esté barato, zapatos y ropa. Siempe me ha gustado economizar más mi dinero para que me alcance para todos mis gastos personales y familiares, pago de renta. I do my shopping in different stores. I at least look for where things are the cheapest. In Walmart I buy my personal items: soap, shampoo, detergente, bathroom liquids. At the store Mi Pueblo I buy part of my groceries. I look for what’s on sale. At the Chinese store I buy the rest of my groceries, always looking for what’s on sale. I buy my clothes at Ross, and yes, I always look for what’s inexpensive, shoes and clothes. I have always liked to economize and save my money so that it covers all my personal and family expenses, rent. El día de San Valentín es una fecha muy especial para los enamorados y creo que para toda persona que tenga un amigo o amiga a quien expresarle su afecto y cariño. Una fecha que nos recuerda que somos queridos y recordados por la familia, o por alguien especial. Cosa que por supuesto se siente bonito y que nos hace especiales para alguien. Valentine’s Day is a very special date for lovers and, I believe, for anyone who has a friend to express affection and love to. It’s a day that reminds us that we are loved and remembered by our family, or by someone special. It’s something that of course feels nice and which makes us special for someone. But in my opinion, I sincerely believe that we should express love and affection to one another daily; as human beings and as brother and sister inhabitants of this planet named Earth, forget the materialism and mercantilism that February 14th, “Valentine’s Day,” has turned into. Tags: "Day Worker Center", "Valentine's Day" "day workers", Latino, Mountain View"
Written in Crislene’s English class. Note: Corrections are enclosed in s.
In this new year, my goal is [to] learn more English, because in this country it is necessary [to] understand[,] talk [speak,] and write, if you know these things maybe you could find better work that is the reason for me study more. Hi everybody and Happy New Year. I want to tell [you] something about my resolution for this year. I want to keep learning English and try to have more conversation[s] in  real life. Another resolution I have is [to] keep practice[ing] guitar and bass. I have the music. I would like to get a better job for this year and be positive in  life and remove all the bad things in my life. This year I want learning English very well. I thinks so is possible that I have the focus in this job. I wish the speak, writing in form correct. Understand the English that is what I want. Don’t let me down, ok. I have to increase my knowledge in English language because it is important to get more opportunities in this country. It is hard but [it] is good [to] speak two languages. Have a nice day. One of my goal[s] for this year is [to] study English very hard, and when I [im]prove my English I would like to get a better job. Tuvimos la oportunidad de ver un documental realizado por el Media Center, sobre la realidad del inmigrante hispano en Estados Unidos. Participaron en este encuentro miembros activos del Media Center, amigos lectores del libro y participantes del Day Worker Center. Antes de ver el documental, participamos todos los que allí estábamos, de una pequeño refrigerio e intercambio de experiencias. El documental fue realizado por el Media Center, y filmado por miembros del Day Worker Center. El trabajo realizado fue excelente, muestra la realidad que existe en cada persona cuando se ve en la necesidad de inmigrar a un país desconocido, lejano, extraño, y que no es el de él. Tiene que integrarse a una nueva cultura. Esta tarea se vuelve cuesto arriba, muy difícil pues existen muchos elementos que culturales que juegan en su contra. ¿Cuando? Este encuentro tuvo lugar en el instituto Media Center, octubre 11 a las 19:00 hrs. Este centro de investigación comunicacional posee una señal de canal de televisión y d servicio informativo a la comunidad, también se efectúan debates políticos y temas de interés comunitario. ¿Por qué? Existe la necesidad de hacer conciencia y establecer puentes comunicacionales entre la comuniad inmigrante y los habitantes de la península, por ello este documental que describe y da a conocer la realidad de la comunidad inmigrante. Tres son los objetivos planteados por este trabajo documental. Tener una visión más comprensible hacia leyes que protejan a la población inmigrante, y le permitan una mejor integración y comprensión entre las diferentes culturas. Crear, además, un instrumento de difusión que sirva para dar a conocer nuestra organica, Day Worker Center, y que se traduzca en mejores oportunidades de trabajo y desarrollo. A todas luces, este documental es bienvenido y un agradecimiento especial para sus gestores. Sin duda se debe perseverar en estas iniciativas creativas para generar una atmósfera cálida por todos sus integrantes. We had the opportunity to see a documentary made by the Media Center about the reality that Latino immigrants in the United States live. Participants and attendees for the screening included active members of the Media Center, members of Elliot’s bookclub, and individuals from the Day Worker Center. Before seeing the documentary, we enjoyed some light refreshments and shared stories. The documentary was made by the Media Center, and filmed by members of the Day Worker Center. The work that they did was excellent. It shows the reality that each person lives when they find themselves needing to immigrate to an unknown, distant, and strange country that isn’t their own. One has to integrate into the new culture. This task becomes an uphill battle, very difficult since there are cultural elements working against you. When? This screening took place at the Media Center, October 11 at 19:00. This center for research in communications has a TV channel and informational service for the community. They also hold debates around politics and topics of interest for the community. Why? There is a need to spread awareness and build bridges between the immigrant community and those who live on the Peninsula. Because of this, the documentary describes and presents the reality of the immigrant community. A more humanitarian welcome for immigrants, who only want to work and obtain better conditions for themselves and their family. With this documentary, the ties are strengthened between the different cultures. To give a viewpoint more understanding towards laws that protect the immigrant population, and that allow better integration and understanding between cultures. To create, in addition, a way to spread information that lets people know about the Day Worker Center and that translates into better opportunities for work and development. Clearly, this documentary is welcome and a special thank you to everyone who helped create it. Without a doubt they should continue in these creative initiatives to help foster a warm atmosphere for everyone in the community. Earlier this summer the Day Worker Center took on a new project: green house cleaning. We now have 16 workers (so far, there will be another class soon!) certified thanks to funding by the Los Altos Rotary Club and the volunteer services of Geri Spieler, a Certified Green Remodeler with training in Green Sustainable living skills. What is green house cleaning? Expensive cleaning supplies purchased in stores are often toxic and actually don’t do a better job at cleaning than home-made concoctions. Solutions of white vinegar, baking soda, cornstarch, toothpaste, and ammonia can be just as effective and more environmentally friendly. Geri went over the many different recipes that are used for different cleaning tasks, as well as the proper cleaning of different materials—natural wood, natural stone, tile, and laminate. Also covered were professional presentation skills, marketing and promotion, taking estimates, and more. 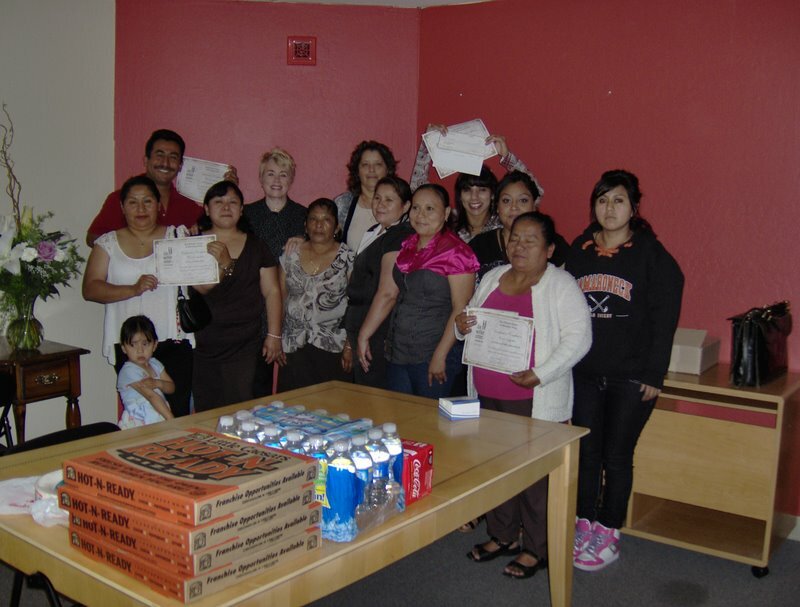 To end the course, workers were introduced to the documents needed to obtain a business license. It quickly became apparent that the green cleaning classes was only the first step! Certificates in hand, celebrating the end of the course.